Richardson Jackson Paisley was the son of Robert and Hannah Paisley. He was born in Aughnacloy on 27th December 1897. He was the eldest of two sons. By 1911 the family were living near Clogher. His father was a farm labourer. Richard was a member of Clogher Ulster Volunteer Force and also of Fardross L.O.L. 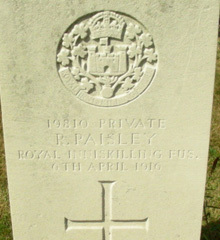 Richard Paisley was with the 9th Battalion of the Royal Inniskilling Fusiliers when he died of wounds in Belgium on 6th April 1916. He was 18.